We left ourselves with too much work to do with a very poor opening 25 minutes of our top of the table clash with Garrymore this evening. At that stage we were 9 down and should have been more save for bad shooting by Garrymore. From there on in we more than matched our opponents and with a bit of luck could have got something out of the game. Four points in the last five minutes of the half from Kevin McShea, James Sweeney, Gerry Callaghan and Pearse Walsh brought the deficit back to 5 at the break. Garrymore extended it after the restart but points from James Sweeney and Gerry Callaghan kept us in the game. It was our turn to have some poor wides and a ball off the crossbar which could have narrowed the gap further. Both teams swapped two points to keep it at 4 points with ours coming from a Kevin McDonagh free and one from play. 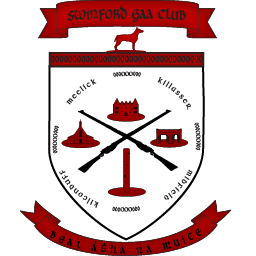 James Sweeney got another to bring us within three but that was as close as we got as we again swapped points to end the game Swinford 0-10 Garrymore 0-13. We are now in third spot behind Garrymore and Ballina entering the last round of games on the 25th September. We are home to Aghamore while Ballina and Garrymore are home to Kilmovee and Westport respectively.